A nice thick crust with olive oil , whitch gives the dough a different taste , much more crunchy and more tastefull for pizza with a mediterranian air. Mix yeast, 1/2 cup flour, and 1/2 cup water in a bowl covered with plastic wrap. Let rise for 15 minutes. Stir to deflate. Mix 2 cups of remaining flour with salt, 1 cup cool tap water, and oil. Add yeast mixture. Mix in remaining flour. Knead 15 minutes on a floured surface (10 minutes in a machine) until smooth. Place dough in bowl dusted with flour and cover with plastic wrap. Let rise until doubled (1 to 2 hours). Punch dough down and put in ziploc bag in the refrigerator until ready to use. Preheat oven to 500F. 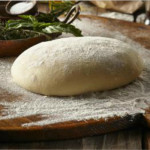 Remove dough from refrigerator when ready to shape into crust. 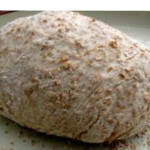 Punch down dough thoroughly and roll out dough on a floured surface. Lightly oil (olive) a 17 1/2″ X 11 1/2″ X 3/4″ pan. 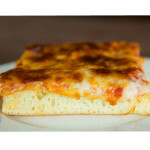 Place dough in pan and push to stretch evenly leaving a lip up against sides of pan. Let rest for 10−15 minutes (while you prepare toppings). Stretch out dough again (it will have receded) and place desired toppings. Cook in center of oven until crust is golden brown. 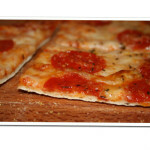 Its a perfect dough , if you want to make a mediterranian pizza with many fresh vegetables and with olive oil . This recipe makes a 17 1/2″ X 11 1/2″ Pizza.